A simply classic 18ct white gold ring, channel set with 1/4ct of glittering diamonds. As the inventors of the Ideal Cut, Tolkowsky adheres to the highest standards of quality with diamond centre stones that achieve the best combination of fire, brilliance and sparkle within the diamond. 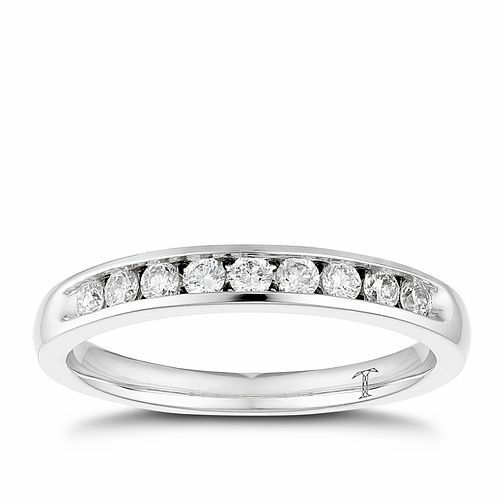 The perfect wedding band to accompany a Tolkowsky engagement ring, or as an eternity ring for a loved one. Tolkowsky 18ct white gold 1/4ct I-I1 diamond ring is rated 5.0 out of 5 by 2. Rated 5 out of 5 by Anonymous from excellent sparkly ring Have bought this ring as my wedding band to match my engagement ring worth every penny. The sparkle this ring gives out just makes you smile every time u look at it.The staff were again brilliant wouldn't purchase my jewellry from anywhere else.